Corinthian Colleges has announced the closure of its 28 ground campuses just two weeks after the US Department of Education fined the student-debt-fueled institution for $30 million based on falsified job placement data and other fraud allegations. Corinthian said it was attempting to help students find other education outlets amid the unexpected closures of its 12 Heald College campuses in California, Hawaii, and Oregon, and 15 Everest and WyoTech schools in California, Arizona, and New York. The unanticipated closures will affect around 16,000 students enrolled in Corinthian programs, AP reported. Corinthian's revenue doubled to $1.75 billion amid the Great Recession, from 2007 to 2011. The institution relied heavily on funding from federal student loans and grants. According to the company's filings, Corinthian schools generated $1.2 billion in government loans in its last year. "This has really exposed the shortcomings of federal and state oversight, and the accreditation system," Pauline Abernathy, vice president of the Institute for College Access & Success, an advocacy group that specializes on student debt issues, told the Los Angeles Times. "The fact that a school could be allowed to get so big and so reliant on taxpayer funding — and to harm so many students without action being taken sooner — really exposes the need to reform the system at all levels." In recent years, Corinthian, one of the largest for-profit higher education systems in the US, has weathered steep cash shortages and a host of fraud accusations, including fake job prospects offered to students. Last year, federal pressure pushed Corinthian to sell off most of its schools to a nonprofit student loan servicer. Yet many of those new campus owners were able to ditch Corinthian's liability while former students with Corinthian debt were not bailed out in similar fashion. In recent months, dozens of former Corinthian students engaged in a debt strike to protest the Department of Education's handling of the dodgy for-profit institution. “The [Education] Department has chosen to bail out the company while sinking students in a lifetime of debt for degrees that many experts have called worthless,” the debt strikers said in March. Then, this month, the Education Department fined Corinthian’s Heald College for an alleged pattern of distorted post-graduation employment data and other records. 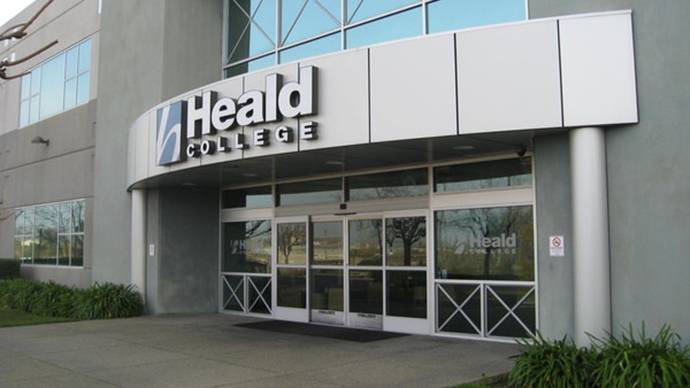 Corinthian agreed to sell or close its remaining campuses, though the state of California refused to drop liability for any prospective buyers of Heald College, effectively blocking its sale. The company claimed Sunday it had been in “advanced negotiations” with several prospective buyers to sell the colleges and to allow partners to continue running Everest and WyoTech operations, but the efforts proved unsuccessful. "Unfortunately, the current regulatory environment would not allow us to complete a transaction with several interested parties that would have allowed for a seamless transition for our students," Corinthian CEO Jack Massimino said in a statement, AP reported. The company also said its graduation and job placement rates "compared favorably with community colleges,” and that many of its students opted for Corinthian based on shortcomings of the traditional higher education system. "Neither our board of directors, our management, our faculty, nor our students believe these schools deserved to be forced to close," Massimino said. Some current and former students are petitioning the Education Department to waive their federal student loan debt based on the department’s allegations. Corinthian's nontraditional accreditation standards will make it difficult for any student to transfer its credits to a community college or four-year institution. "The last two and a half years I spent going to that school — the trouble, the time, the money I spent on gas — I feel like it was a waste of time," one Corinthian student told the LA Times. "I'm pretty much at a complete loss right now. I'm not even sure what the next step is." Representatives of California's Department of Consumer Affairs will reportedly offer information sessions at many Corinthian campuses this week to aid students. In fall of 2014, the Occupy Wall Street affiliate Strike Debt helped purchase $4 million in private student debt owed by former attendees of Everest College in turn freeing those former students from a huge chunk of the burdensome loan bills.